Both Sierra Leone and DR Congo fell to defeats in their opening encounters., but the manner of their respective demises couldn’t have been more differing. 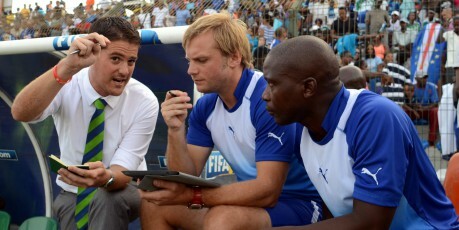 Hosting a vulnerable Cameroon, DR Congo rarely made life difficult for Volker Finke’s under pressure side. Goals from Clinton N’Jie and Vincent Aboubakar ensuring the Indomitable Lions post World Cup bow progressed without the alarm anticipated. Nonetheless, that display provided ample evidence that Sierra Leone – currently occupying an all-time rankings peak of 50 – are from in the group to merely make up the numbers. On the surface, Sierra Leone should arguably be entering the contest as favourites, against a side who in recent years have anything but pulled up trees. In World Cup qualification DR Congo won just a single group game, with Saturday’s disappointing showing offering minimal hint of that trend being reversed. The leone stars are, however, hindered by a game designated as their home fixture being hosted in DR Congo, with the Ebola crisis meaning Sierra Leone judged as unfit to be considered a suitable venue for international football. After significant futile searching for an alternative location, DR Congo finally afforded Sierra Leone respite with Wednesday’s qualifier scheduled for Stade TP Mazembe in Lubumbashi – the same venue in which the Leopards fell victim to Cameroon. From a purely logistical perspective, the change of venue, given the absence of a transition period to what was previously a genuine away fixture, allows DR Congo a significant advantage : an ability to claw back chunks of the ground the leopards concede in regards to momentum. To counteract that, there is feasibility that DR Congo will be hindered by the absence of skipper Youssouf Mulumbu who hobbled off on Saturday. For both sides the fixture signifies a pivotal encounter, with any potential defeat liable to leave either facing a mountain to climb in order to make Morocco. Sierra Leone carry the impetus, yet the absence of home comforts has the potential to prove terminally detrimental for McKinstry’s side.